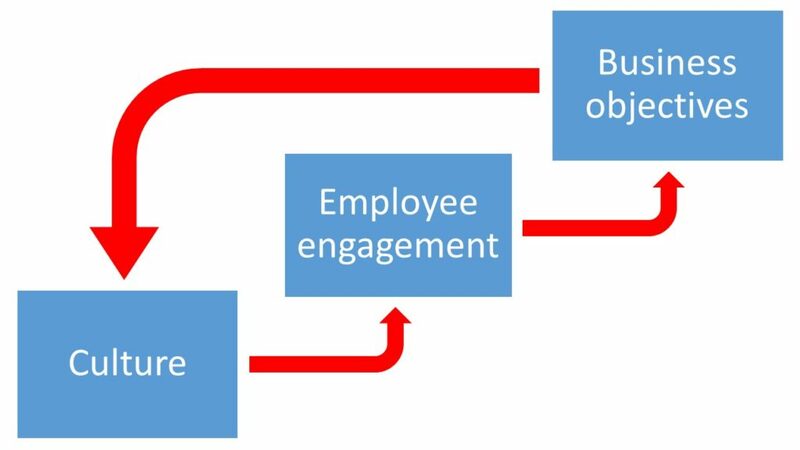 In the last blog post in this series I talked about my personal experiences of the impact culture can have on engagement, and therefore the delivery of business objectives. Following on from this, I want to now look at how these fit together in a model, and how the relationship between them is driven. If we look at the model below. We have seen how the right culture encourages the right behaviours and values. Those behaviours and values directly drive employee engagement. 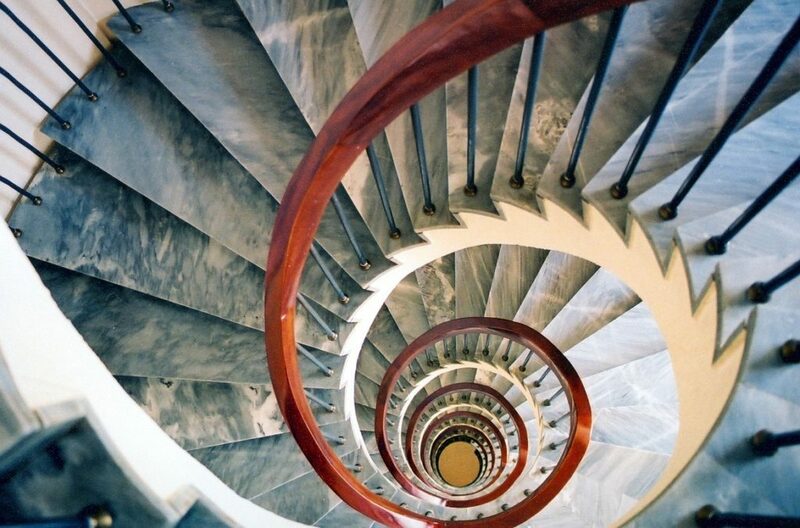 Going back to our “rock up a hill” analogy, we know that where employees are engaged with our business objectives, we are that much more likely to achieve them. And here’s when it gets interesting. Because an organisation which is achieving its business objectives, can start to do more to encourage and nurture that culture. We know that if we are achieving our base level objectives, we move out of survival mode and into enhance and develop mode. We become able to invest more back into our business: time, money, support. As we do so, we further drive the right cultural behaviours and thereby employee engagement levels. 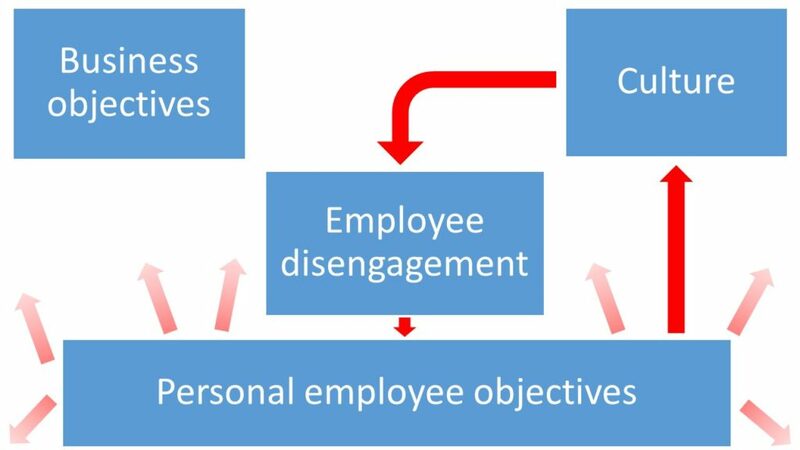 Employees better engage with our business objectives. We better deliver. And so the positive cycle continues. But what happens when that isn’t the case? What happens when the values and behaviours prevalent in your organisation’s culture aren’t those which drive engagement? Well, let’s turn the model on its head. In this scenario, the reverse is happening. The culture we have here isn’t driving engagement. Instead, it’s actively driving employee disengagement. Think back to the situation I found myself in in my very first HR role. The prevailing culture was actually driving me to become disengaged. When employees are disengaged – I refer back to the rock up the hill analogy – they are not going to engage with your business objectives. Their focus instead is solely on their own personal objectives. Now, while we might get lucky, and find some of those personal objectives align with our business objectives – for example, most of us will want to keep our jobs, and most organisations will have a core objective of wanting to remain trading – in the majority of instances these personal objectives are very disparate. Consequently, employee focus becomes scattered, and moves us further and further away from our business goals. What we also see happening in this scenario, is those personal objectives feeding back into our culture. This creates a culture which further drives disengagement, which further distances employees from the business objectives… and so on, and so on. What these two models should therefore have made clear is that everything comes from our culture. As a result, it is critical that, as HR practitioners and senior stakeholders, we invest what might feel a disproportionate of time in nurturing and developing that culture. Because, when we get that culture right, everything else will follow. Next time, I will be looking at what that ‘right’ culture needs to look like… and an exercise which allows us to move away from the fluffy, ethereal concept of culture, to something which is real, objective, and can be directly translated into actions which will help us to move our organisation forwards.